Well hey, hey, hey! I’ve got the beginnings of a fun new renovation underway here at House of Hepworths. 3M reached out to me and asked if I’d like to try out some of their new ScotchBlue Painter’s Tape with Edge-Lock Paint Line Protector. Being a DIYer I go through lots of painter’s tape, so I jumped on this generous offer to try out the new ScotchBlue Painter’s tape. The tape couldn’t have come at a better time. I’ve been gearing up to repaint our guest bathroom which is currently affectionately known as “The Gallbladder Bathroom”. Why? Well, because it’s the color of a gallbladder. 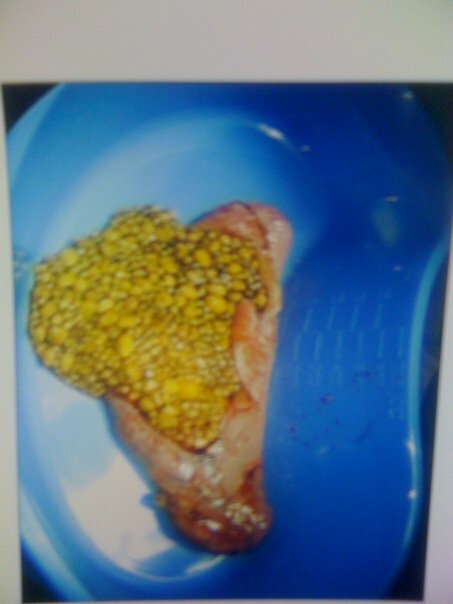 I would know considering our Besties, Billy & Heather, sent us a photo of her gallbladder after she had it removed. Don’t we have the greatest friends?! They then proceeded to post it on their facebook page. They really are so generous with their friends. See for yourself (the bathroom, not the gallbladder ;)): If you want to see the infamous gallbladder picture, CLICK HERE but do so at your own risk. I am not responsible for you barfing on your keyboard. I’m surprised this paint color lasted a year and a half. I’m also equally surprised I didn’t have a gallbladder attack every time I used said bathroom. So, anyway, getting this free tape was just the kick in the pants I needed to start on the bathroom. The caulk around the sink was gross, covered in gallbladder paint, and was sloppily applied, so the first order of business was to remove all the old caulk and prep to apply new caulk. 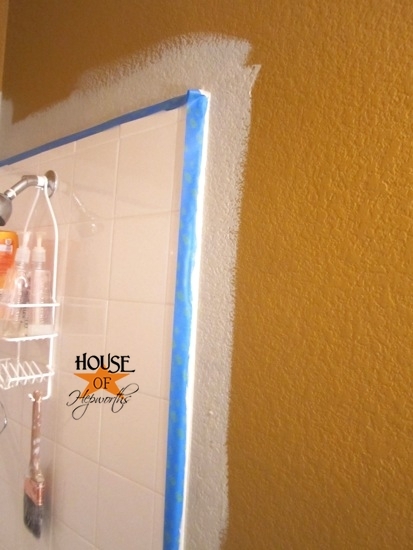 Once I had all the caulk removed I used my new ScotchBlue Painter’s Tape to tape off where I was going to caulk. I didn’t tape the wall because I was going to paint it anyway but I did tape along the sink cabinet and counter top so I’d be left with a crisp perfect caulk line. I decided to go with my go-to white paintable washable bathroom caulk. 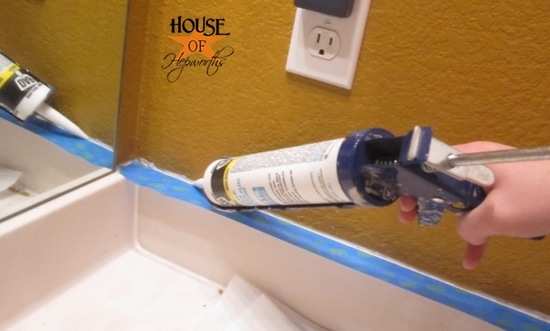 I simply added a bead of caulk along the painters tape then smoothed it out with my finger. 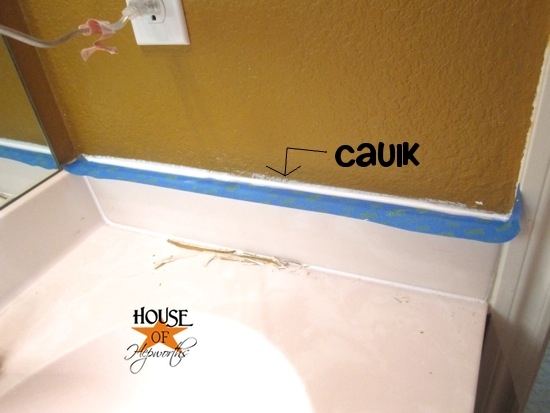 The trick with taping off caulk is that you need to remove the tape before the caulk dries. 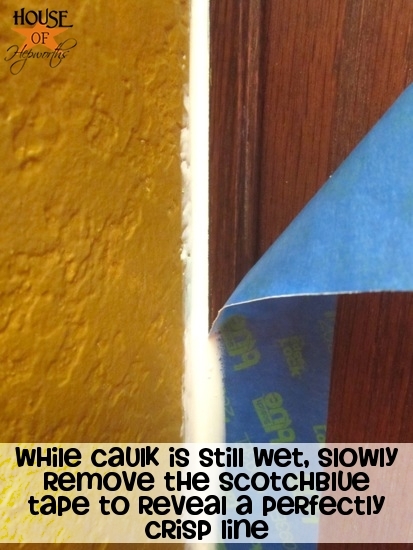 I carefully peeled back the tape to reveal a perfect caulk line. Sweet! 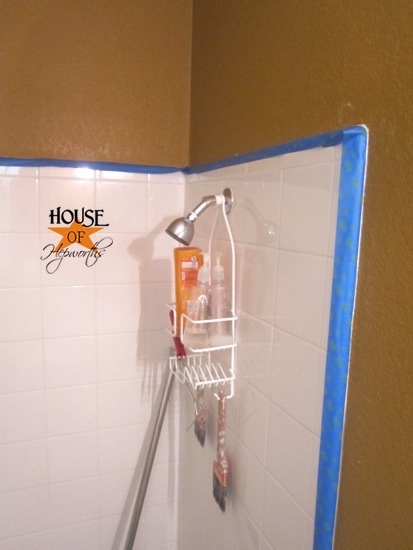 Once all my caulking was done and dry I started prepping the bathroom for painting. The tape went on smoothly and in no time flat. 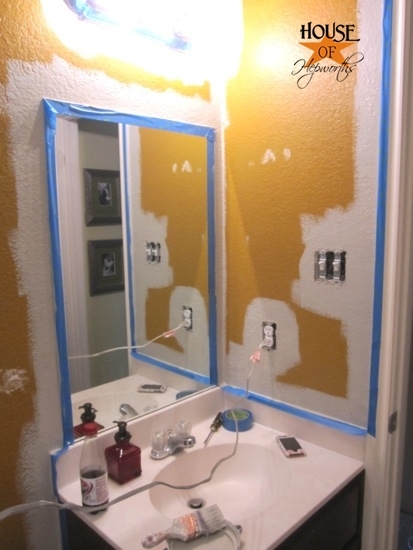 Once the bathroom was taped off, I began cutting in along the tape. I was shocked how much faster it was to cut in when the room is properly taped off! Usually I’m lazy and just free-hand it. While the paint was still slightly damp I began removing the tape. 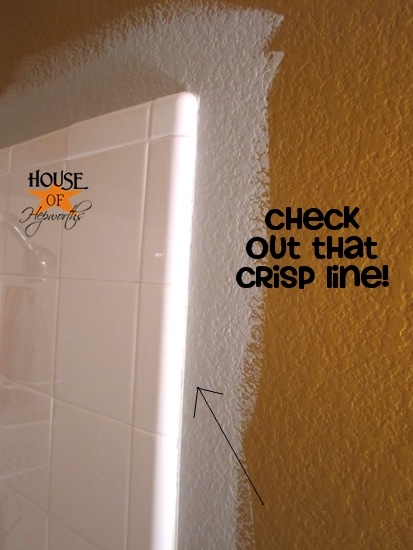 I’ve found that removing the tape while the paint is still wet makes for an even crisper line and less/no peeling of the actual paint. So, how did the ScotchBlue Painter’s Tape fare? Quite impressively if I do say so myself. Not only was it so much quicker to paint the room once it was taped off, but the ScotchBlue Painter’s Tape did an excellent job blocking the paint from seeping under. I also really liked that it is somewhat thick, so when I peeled it back off when it was wet with paint, it never once tore. When I use cheap painters tape the tape tends to shred and tear making removing it a beast. 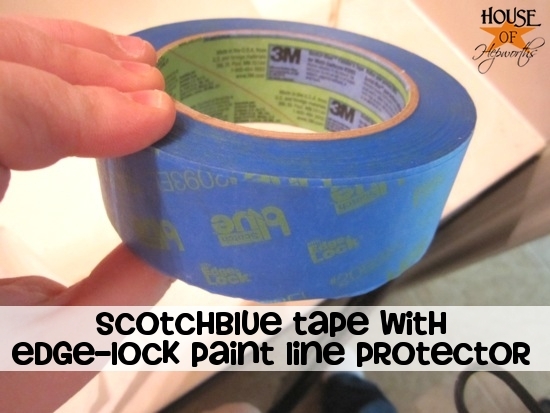 But this ScotchBlue Painter’s Tape peeled away effortlessly and tear-free. 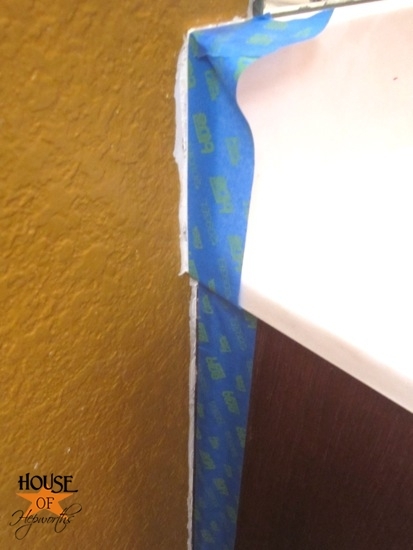 I do want to mention though that if you have textured walls and are wanting to paint lines on your wall, you will still want to seal off your tape edges to prevent paint seepage. 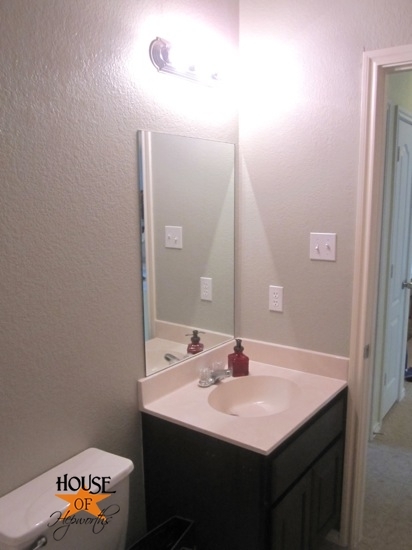 As for finishing up the bathroom, stay tuned for additional posts! I’ve only just begun to turn this Gallbladder Attack into the calm, serene atmosphere it deserves to be. Great product review!!! I’m sold! I had to click on the gallbladder picture because I just couldn’t resist. Ewwwww…and the room totally was the same color! Love the new paint color. 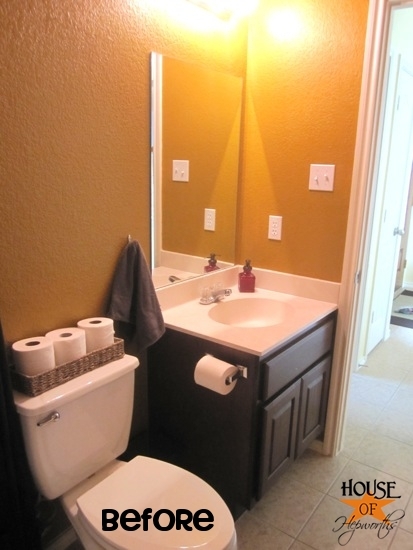 I need to repaint one of our bathrooms. It’s bright purple. My solution so far has just been not to use that bathroom…ever. Oh what a horrible picture (the gallbladder, not your bathroom) 😉 I had mine out years ago, but never saw it. That’s so gross! I HATE the tape that comes off in bits/pieces, always leaving pieces behind that are hard to get. And I was not a fan of the green stuff. Tried it when I painted my craft room & ran out of the awesome blue stuff & it wouldn’t even stay stuck most of the time. 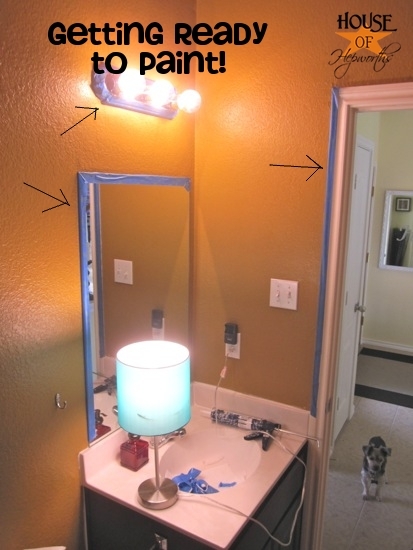 I’m DEFINITELY going to try this, especially since there is painting in my very near future. Did you get picture rights before posting that photo? 😉 And can I just add that I bet “your friend’s husband” probably posted that picture right after “your friend” had just come out of anesthesia. I’m just guessing. And she probably would have never agreed had she been lucid!! But she must be quite a friend to share such an intimate picture with you. Thanks for making my internal organs famous! Hey there! I’ve been looking for your archives- do you by chance have a post that talks about why you add text to photos for pinning purposes? (for example, I came to your site when I repinned your photo that has the How to make your own curtains text on it) I’ve seen the post that talks about why you watermark, but I thought I also read one that mentioned why you put info like that on photos for pinterest. Any ideas? Was that you?? Thanks for any help you can provide! You can use picnik.com but they’re closing in April. So SAD!!!!! LOVE the scotch blue tape! I use it every time I paint. Never fails! Ahhhhhh the white wall is so much nicer…relaxing! Whenever I paint a bathroom I end up having to remove the toilet to paint behind it. Is there an easier trick to it? I just bought some paint to do my powder room, and I found it in the oops section so I’m not sure what it’s really called, but it looks like your gallbladder attack color. I sure hope it looks better on my walls than yours. Thanks for the review of the painters tape, I’ll have to try that kind too. Gee, and all I ever got was a picture of my BFF’s uterus. Wait, think I saw a shot of the inside of someone’s knee too. Can’t remember may have blocked it out. Send 3M my way, they live right down the block! 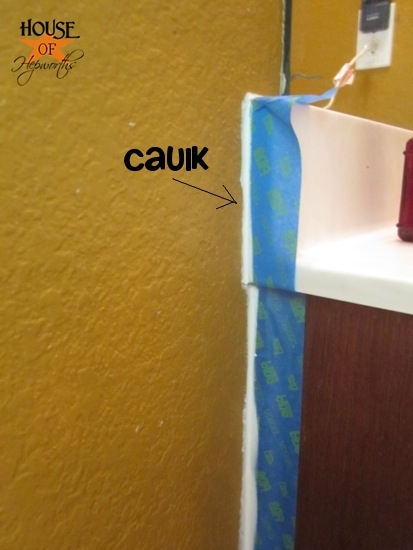 Great idea using painters tape for caulk!!!! 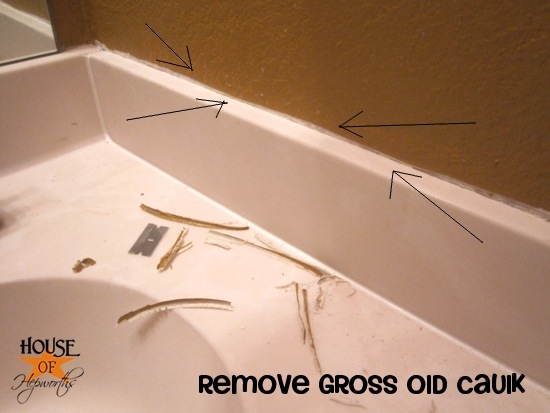 In our old house, my husband used to make such a mess putting new caulk in our bathroom. It would drive me nuts. This is so much nicer!!! Did you get a new bloggy makeover? I love the new clean look! 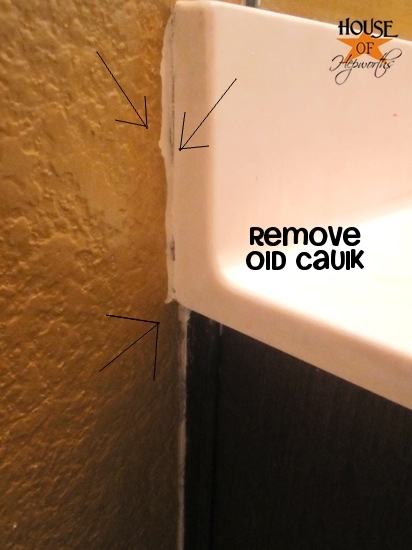 One question though: why caulk first? Wouldn’t it be easier to paint everything and THEN caulk? I had such a hard time with tape recently! We really need to get some of this thicker stuff because mine get ripping and tearing into pieces! You had much better luck than I did. With the ScotchBlue my paint bled through just as much as with the regular green stuff, and it tore quite a bit when I removed it. I have really flat walls and I removed it when the paint was still wet, so no weird situations. I was really disappointed. Love your straight lines! I am going to have to try this! 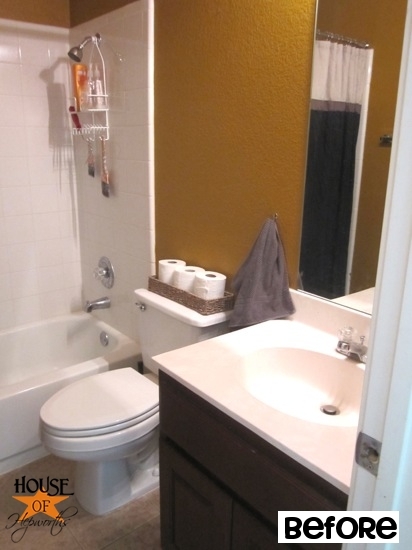 My bathroom is the same color! I just called it the color of ‘yuck’. Thank you for giving it a name. 🙂 I’ve been toying with repainting and went so far as to pick out a few colors. If the Scotch tape is as easy to use as you showed, I may do it by myself. So 5 years ago we moved into our house. After having builder beige walls for pretty much our entire lives my husband and I decided we were going to fill out house with COLOUR! My father-in-law was very generous and offered to come paint our entire house. I learned two things from this experience: 1) When choosing wall colours, it’s typically best to pick one from the lightest end of the paint chip sample and not the bottom. 2) Don’t let your Father in law paint your whole house before you come and check the colours. Always do a sample patch. Why? Because my living room, dining room and hallway are pretty much this exact gallbladder colour (partly due to the fact that it was mixed wrong and partly due to me choosing too dark of a shade). Now I have a name for it. Thanks! It might be enough to convince my husband to let me paint. hehe! I can supply working vids of my young son age 7 having KNEE SURGERY. The INTERNAL part of the surg! Who knew you could even GET them to give you a CD of this! I have often made mention that since he had to have the SAME thing done on the OTHER knee AND I have a Dremel and a modicum of surgical knowledge at any time I am ready to DIY any OTHER joint problems family members might have. Now NEXT WEEK the hubs is having—-knee surgery. So you just KNOW that he has been hearing of my skill and daring use of said Dremel and how much we will SAVE doing it this way! And what NICE colours embroidery floss comes in these days! And of COURSE I will bling out his crutches with the awesome Zebra Duct Tape edged in HOT PINK. Will let you know how this works out for him!